MAGIC UNITED WAS ESTABLISHED IN 2006, THE COMMITTEE AND CLUB MEMBERS WORKED TIRELESSLY TO SECURE A HOME VENUE WHICH BECAME THE CURRENT CLUB LOCATION OFF BIRMINGHAM ROAD. In 2013 the club took on a new direction towards a more professional approach on and off the field. The first priority for the committee was to have professional coaches deliver all sessions with juniors to seniors. The second priority was to build a functional Club house for all members, which has become the heart beat of the club. The third priority was to set a strategic plan that will make sure the club progresses and grows over the foreseeable future. The results of the new approach is there for all to see in terms of player development, functional club house, team success, club growth, new sponsors and community participation. The Club also successfully received a Get Playing Grant of $84,000 at the end of 2014 which will allow the Club to build new changing facilities in 2015. In 2016 irrigation was installed as was a fence around the permitter of field 1. In 2012 the Club had 135 members. Year on Year growth has seen this number rise to 500 members in 2017. We also make a special mention for MP Ros Bates, MP Sid Cramp and Cr Bob La Castra and thank them for the support they have provided the Club and the Community. 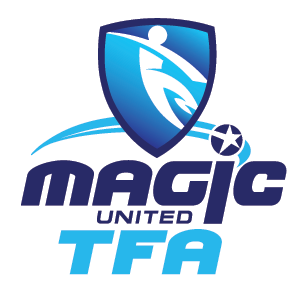 Magic United TFA is committed to developing players who will continuously grow and challenge themselves in the quest to become the best their talents allow. Magic United TFA provide development that inspires and equips players with skill, strength and competence that will guide players to long term success in football. We see grass roots football in Australia going to a new level, raising future football leaders who will change the game.